Mao Linda, 31, was arrested at her home in Poipet City on Saturday, the day after she criticized Mr. Hun Sen in a Facebook comment on a post by media outlet Fresh News about a speech given by the premier discussing the U.S. bombing campaign in Cambodia in the 1970s. 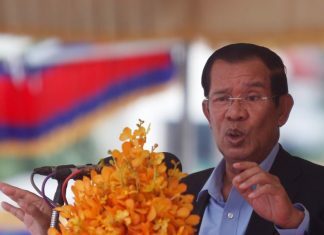 “Cambodia cannot accept Hun Sen’s family selling the land of the former king,” she wrote. “The prosecutor allowed her to go back home,” Sith Luos, deputy provincial police chief, said on Wednesday. Mr. Luos said Ms. Linda had a long history of drug abuse—though a police-administered drug test this week came back negative—and suffers from “serious mental illness,” for which she had been previously treated by doctors. According to a report on Wednesday on Fresh News, Ms. Linda was released temporarily after she agreed to write a formal apology letter. It was unclear if she had been charged. A court spokesman refused to speak to reporters.